This product was added to our database on Tuesday 8 March 2016. The C-130 has served the United States Air Force for over 50 years and it has undergone many changes to its engines and avionics. The super Hercules is the latest version featuring an extended fuselage and updated engines with 6- blade propellers. 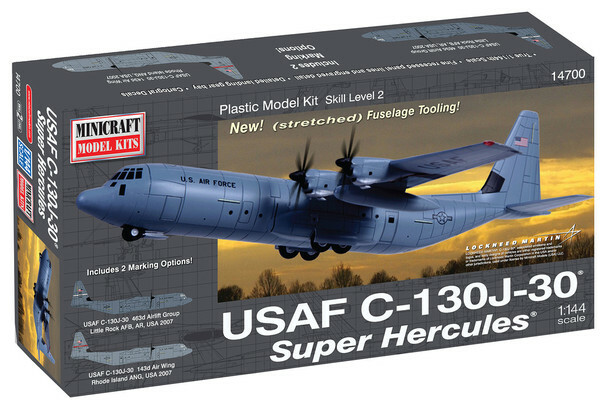 The new Minicraft C-130J-30 features new fuselage tooling representing the latest variant of the C-130. The kit also features new "J" engines, recessed panel lines, interior cargo bay and position-able rear door and up-dated engines with unique scimitar propeller design and 2 USAF markings.